This afternoon I attended some fantastic presentations and met some fascinating vendors. At mid-day we heard from Kenn and Kim Kaufman. Yeah, we all know Kenn is a great guy and a super cool birder, but I have to say that Kim impressed the heck out of me. She was a charming and endearing speaker. She inspires her listeners and is a wonderful advocate for birds and birders. Jeff Gordon - speaking on the "new" ABA. He really needed three more hours than the one he had to really convey his message and handle our questions. I have to say that it is because of his listening and responsive leadership that I am a fan of the ABA. My main take-away from his comments is that he wants the ABA to be an organization that provides its members meaning by helping them do what they want to do in birding better than they could on their own. You decide what your mission as a birder is, and let's see how the ABA can help. This is a profound difference from "What does the ABA provide me for the cost of my dues?" Think on it! I got to see Alvaro Jaramillo in action as a bird guide this morning and to see him as a presenter this afternoon. He was really great. He seems to look at birds a different way than most birders and he can describe what he is looking at extremely well. He shared one insight that I thought was brilliant...pay attention to the emotional content a bird's appearance may have for you. Does the face look sad, pensive, angry, cheerful, etc. Not that we are assigning these birds those emotions, but rather engraving those physical traits in our minds with this memory device or association. What a cool guy! This evenings keynote speakers included Bridget Stutchbury and Pete Dunne. Bridget is one fantastic presenter. Her ability to share her bird studies in a way that was fun, interesting, and understandable was just wonderful. Pete Dunne gave a couple of readings, one I assume he wrote for this event, and the other was a selection from his soon to be released book Arctic Autumn. Both were poetic, nostalgic, and thought provoking. These guys provide tours in Guatemala. Algun dia! They had a wonderful assortment of brochures that made me long for a trip to Central America. They also had some really cool give-aways at their booth. I got to meet Hugo Haroldo Enriquez Toledo who was featured in the March issue of Birding. 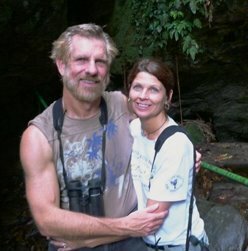 The Ohio Ornithological Society is making a trip to Guatemala in March 2012, so check it out! Opticron is an optics company out of the UK. I had never heard of them before, though I now know that they have been selling popular optics in Europe for several decades. Look for them to enter the US market with some force soon. Many companies in the birding industry have donated loads of raffle prizes all for the purpose of conservation. Peterson Guides donated an iPad2 and there are some other really cool prizes like optics. Half the prizes were awarded tonight, but there is still the opportunity to win more tomorrow. Just an hour west of here, my Boise State Broncos are playing Toledo. I'm gonna watch the rest game and then get to bed. I'm planning to go birding with Greg Miller in the morning. Pretty cool huh? The Midwest Birding Symposium is awesome! Robert, so glad to see this post and so glad that you are having so much fun! Wish I could have been there just so I could meet you! BTW, how's your bird count going? Mine hadn't budged until I went birding with Dawn fine on south beach out on Cape cod. I added 15 new Life birds for a total of 414! Can't wait to see what you end up with!